The arts in the United States were teetering on the brink of revolutionary change in the years just before the First World War. The traditional fine arts, based on an appreciation of the classical ideals promoted in the European Renaissance, were still vital, and an understanding of their rules was important to one’s standing in elite society. At the same time, literature, visual art, and dance based on decidedly non-classical values were waiting in the wings, ready to burst forth and disrupt the cultural status quo. It was in 1913 that the Armory Show introduced New Yorkers to the new radical European movements in painting, such as Fauvism, Cubism, and Futurism, and 1915 when the Denishawn School of modern dance was founded in Los Angeles. So it is no surprise that the Connecticut newspapers from the years between 1910 and 1922 that are being digitized for inclusion in Chronicling America document well the introduction of modernism in the sphere of culture. One of the performers of the “new” in Connecticut was Loie Fuller, or “La Loie” as she was known in Paris. At the Jackson Theater in Bridgeport on July 13, 1910, she danced a program of the type that was celebrated by the European avant-garde. 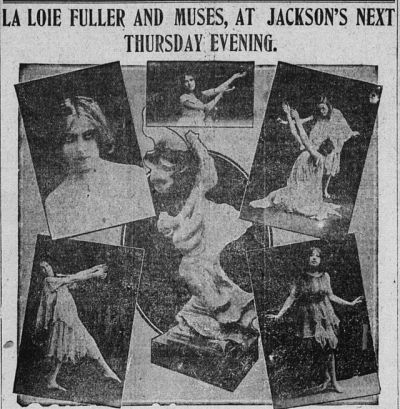 Fuller was completely untrained in classical ballet; her background was in vaudeville. Her manipulation of huge swirling volumes of translucent silk fabric suggested a connection to both eastern veil dances and a burlesque skirt dance, but those allusions were only the beginning of what other modernist artists saw in her performance. An author on the Yale University Modernism Lab site says she was beloved by the modernist poets because she was “expressive but barely mimetic.” Fuller spoke of hoping to convey meaning through the direct engagement of the audience with motion, light, and color. While her ability to launch and sustain the movement of many pounds of silk for a performance of up to 45 minutes took tremendous physical strength, the vision produced was ethereal. The body was dematerialized and in its place were colored auras and the undulating line created by the movement of the silk. That whiplash Art Nouveau line was full of meaning for the artists in the audience; they understood it as suggesting the metamorphosis found in the natural world. Fuller was not only a performer, but an innovator in stage design and technology. Through the elaborate use of colored lighting projected from below, from above, and from the wings, she could be transformed into a butterfly or, seemingly, consumed by flame. At the center of the elaborate program called the “Ballet of Light” and performed in Bridgeport was a refinement of her famous fire dance (Bridgeport Evening Farmer, July 14, 1910), one performance of which is available on Youtube. The “Ballet of Light,” of course, was just one of many modernist performances given in Connecticut just after the turn of the century. A cursory review of the 1910-1922 runs of the Bridgeport Evening Farmer and the Norwich Bulletin, the titles currently being scanned by the Connecticut Digital Newspaper Project for inclusion in the Library of Congress archive Chronicling America, suggest just rich how a resource the newspapers will be for cultural studies of this complex moment in the arts, as well as for families hoping to truly understand the texture of life in the cities of their ancestors. Performances like Fuller’s, their promotion and reception, have much to tell us about values and sensibilities in the years just before the U.S. entry into the European war. Search: “Loie Fuller,” in Chronicling America. Accessed July 29, 2014. Carolyn Sinksy, “Loie Fuller (1862-1928).” The Modernism Lab at Yale University. Accessed July 29, 2014. Ann Cooper Albright. Traces of Light: Absence and Presence in the Work of Loïe Fuller. Middletown, CT: Wesleyan University Press, 2007. Rhonda K. Garelick. Electric Salome: Loie Fuller’s Performance of Modernism. Princeton, NJ: Princeton University Press, 2007.